ThePro6410 NeonColor printer is the easy-to-use, time-saving and affordable alternative to screen printing. Allowing you to quickly and cost effectively deliver unique output with little to no setup costs. Unsurpassed by rival technologies, the Pro6410 NeonColor printer is taking specialty printing to new levels, with a simplicity and ease of use that practically guarantees fast ROI. Innovative OKI NeonColor toner – NeonCyan, NeonMagenta, NeonYellow and NeonWhite – generate the WOW! factor when brought to life under UV black light. They make it possible to create spectacular fluorescent graphics and designs for every kind of product. 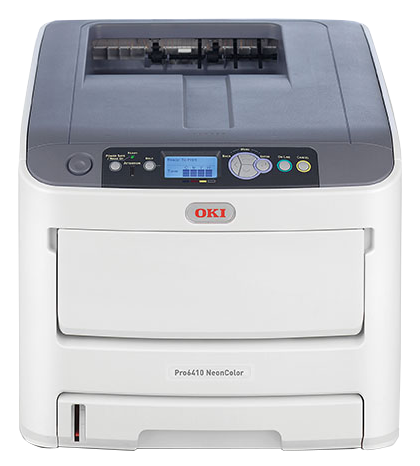 The Pro6410 combines OKI toner technology with proprietary High Definition (HD) Digital LED Color printing to provide vibrant hues and breathtaking detail for a wide range of applications that previously required manual printing techniques or expensive proofing. Plus, when it comes to media versatility, the Pro6410 produces its breathtaking results on everything from labels to envelopes, letter- and legal-size sheets, banners up to 52″ in length, and on paper weights of up to 250gsm. NeonWhite toner applied by the Pro6410 provides dramatic effects when applied directly to dark stock. It supplies an opaque white background for colors printed on or transferred to dark substrates. And it can act as a security mark that’s only revealed when checked under UV black light. The Pro6410 makes it physically easy to produce dazzling fluorescent effects on either dark or light substrates: it incorporates a unique quick-swap feature for NeonWhite and Black toner cartridges that makes “while you wait” a reality. For retail applications, the Pro6410 NeonColor printer produces seductive signage, banners, POS displays and window graphics using fluorescent colors to command customers’ attention and increase sales. With its superior technology, outstanding color capabilities, ease of use, and low cost of ownership, the Pro6410 NeonColor printer is a revolution for the specialty printing industry.